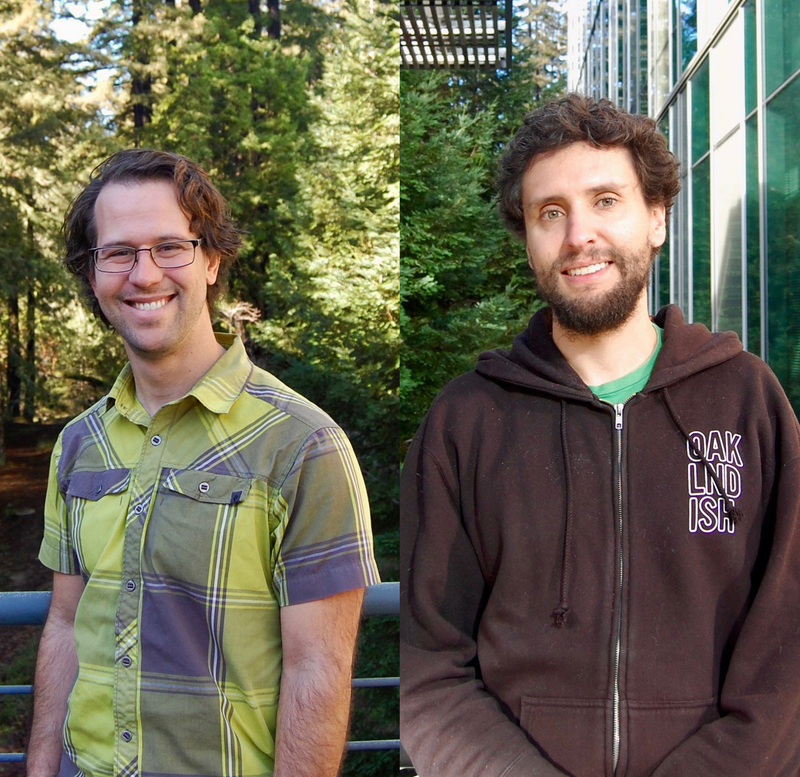 Sean Phillips and Eric Kaltman, graduate students at the Baskin School of Engineering at UC Santa Cruz, are this year's recipients of the prestigious Jack Baskin and Peggy Downes-Baskin Fellowship. Although pursuing PhDs in very different areas, both Phillips and Kaltman are committed to engineering education, research and applications. Both have a keen sense of purpose and direction, both are enthusiastic about where their research is going, and both agree that their Baskin fellowship award is helping them get there faster, and with greater focus. "The original fellowship endowment was to help ensure that the best and brightest young engineers at UC Santa Cruz have the resources and recognition they need to do good work," said Peggy Downes-Baskin, to which Jack Baskin added, "We are pleased with this year's selection by the faculty committee." Phillips studies hybrid systems under the direction of his PhD advisor, Professor Ricardo Sanfelice, in the Computer Engineering department. Hybrid systems -- systems that include quickly changing "discrete" components superimposed on top of more slowly changing "continuous" states -- can be quite complex to model, control and predict. A simple example of such a system is a bouncing ball. While under free fall, the state of the ball evolves continuously before the ball impacts the ground, at which point, an abrupt change in the velocity occurs which can be captured by a discrete jump in the ball's state. Another example is a remote-controlled drone that acts under normal physics but receives instructions from a ground station at discrete times. This is the sort of work Phillips is currently doing: developing computer-controlled algorithms to synchronize the actions of a network of autonomous vehicles subjected to all of the pertinent laws of the physical world. Phillips moved to UC Santa Cruz from the University of Arizona, where he studied with Sanfelice as an undergraduate and helped set up the then-new Hybrid Dynamics and Control Lab. When Sanfelice joined the Baskin School of Engineering in 2015, Sean decided to come with him. "Turns out this place is awesome," says Phillips. "I made the right decision to come here." "Turns out this place is awesome," says Phillips. "I made the right decision to come here." The fellowship will help push Phillips' research forward during this critical stage of his PhD program. "It gives me more time and some financial freedom," reflects Phillips, who is excited to be able to focus on his research. "Also, it's nice to be recognized. I'm pretty excited that they like where I'm going with my research." Eric Kaltman, a Computer Science graduate student advised by Computational Media Professor Noah Wardrip-Fruin, is interested in the history of software, the history of videogames, and ways to reclaim and preserve this history so people in the future can use it, play it and experience it. "I also want to raise awareness about how all these software structures work and how people can become more aware of the technology around them," says Kaltman. "It's important to know how technology is influencing our lives and affecting everything around us." Before coming to UC Santa Cruz, Kaltman was a graduate student at UC Berkeley, where he got involved working with Stanford University's software collections. "I realized there was basically no methodology or practice for how to archive data and software," says Kaltman. "Everything in the archive was books and papers. So I decided I'd go back to graduate school to help with some of the computer science and solutions to those problems." The fellowship has given Kaltman time to refine a set of methodologies he's developing for the archival treatment of software and games. This will not only improve his dissertation in the short-term, but will also have longer-term practical application to a project he envisions for the future: "a virtual library of software." When asked if they have any advice for students considering engineering as a field of study, Phillips says, "Just do it. It's a big field and growing, and will keep growing." Kaltman agrees and states that UC Santa Cruz is a good place to come to "experiment and go a little wild with it," adding that, "at UC Santa Cruz, you can bring to engineering this notion that what you're doing will affect people and might cause some sort of positive social change, which is absent from most engineering education programs." The future is bright for these two scholars. Eric Kaltman is working with the Library of Congress in hopes of creating a large national software archive to help people better understand the "fragility of technical data and information" that is being used currently. He hopes to raise awareness of how fragile and continually changing software and technology is, and to one day create a research group that will deal with these problems. Sean Phillips plans to finish up his dissertation by the end of this year and join a national lab to continue his research on hybrid systems. Previous recipients of the Jack Baskin and Peggy Downes-Baskin Fellowship are: Annalisa Cadonna (Applied Mathematics and Statistics), Sarah Harmon (Computer Science), Jay Kim (Biomolecular Engineerin), and Stephanie Lukin (Computer Science).